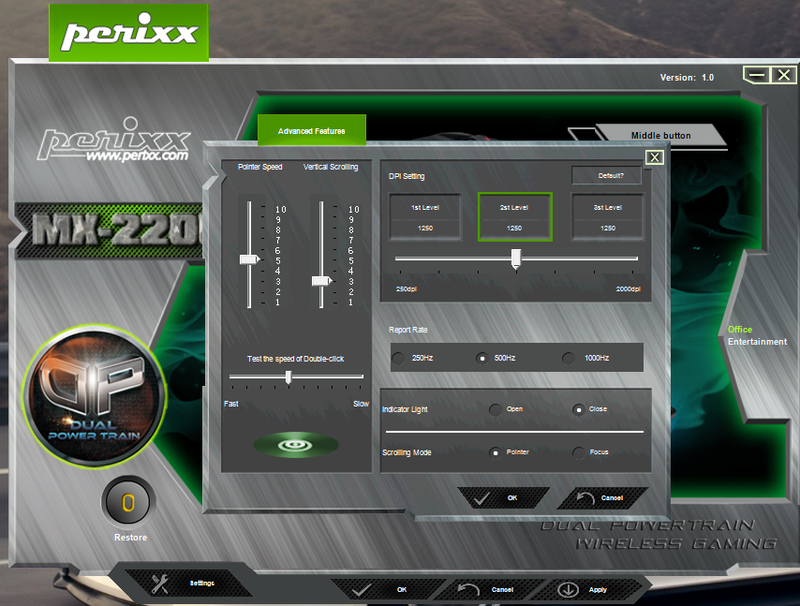 First of all, I would like to thank Perixx for sending me the MX-2200 for review. 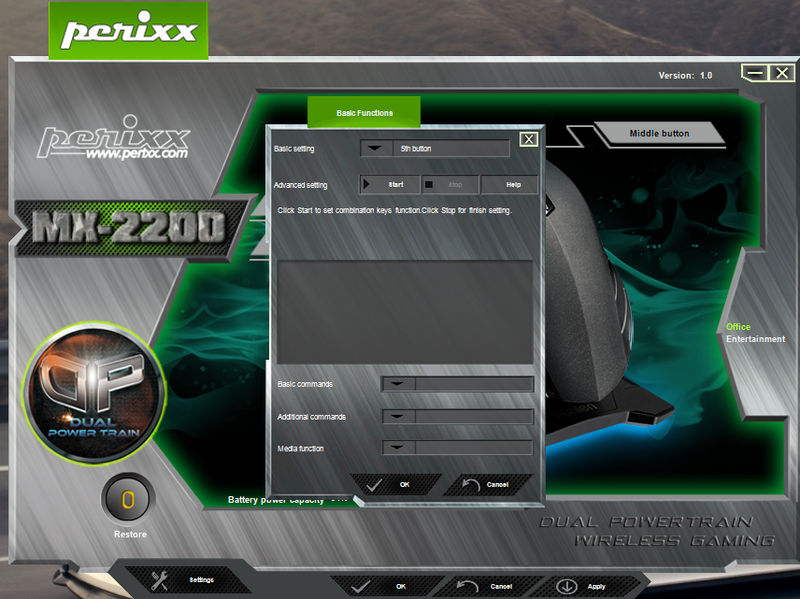 I was very much impressed with the other products offered by Perixx, thus was intrigued to see what this mouse offered. Let’s get unto the written review! 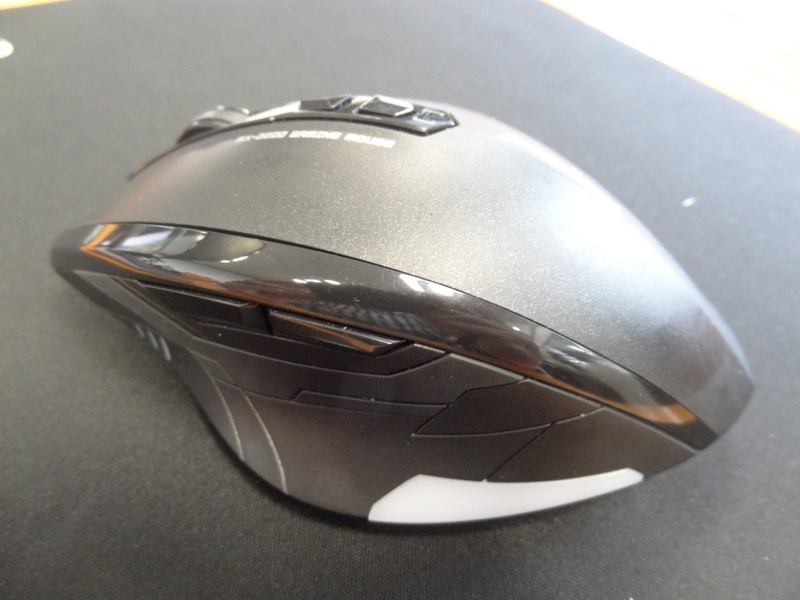 The design of this mouse is excellent. It fits very well in the palm of my hands is is ergonomically excellent. I also asked other people with different size hands to test it out and they also really liked the ergonomics of the mouse. It really isn’t tiresome and can be used for hours upon end. That said, this is only made for people that are right handed. Left-handers will have to look elsewhere. The mouse is a 3 button mouse. 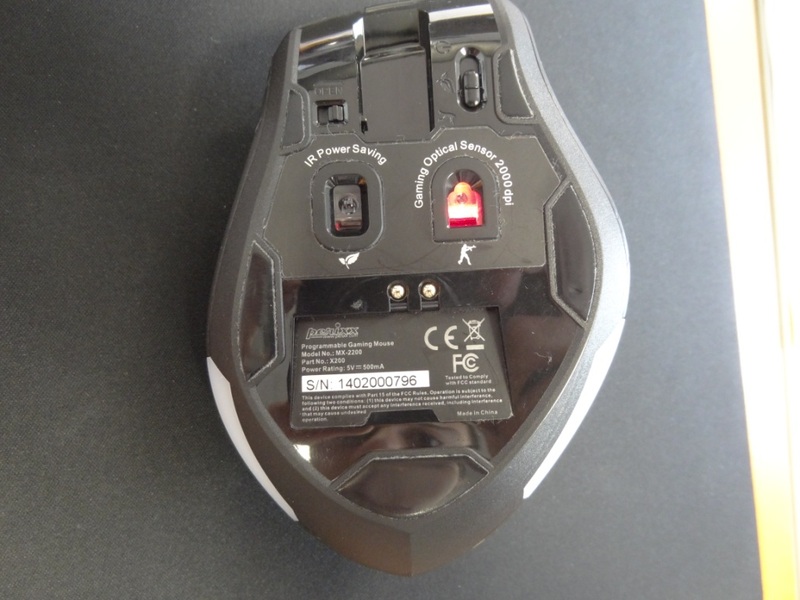 It has the scroll wheel button and two buttons (that are perfectly placed for thumb access) on the left hand side of the mouse. 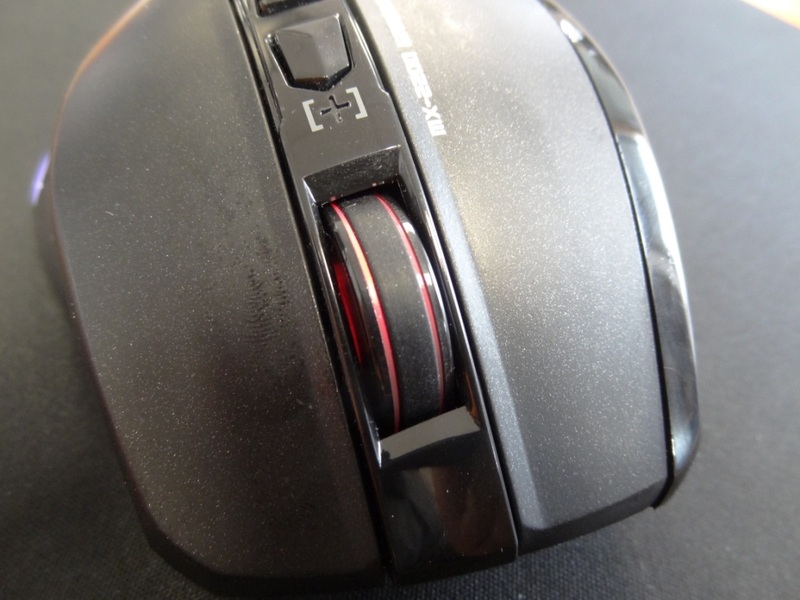 It is rather unfortunate that the two buttons at the top of the mouse, which are used for DPI adjustments, cannot be programmed to something else. I would have much preferred to have the top buttons as “play/pause” for media usage and bound to a keyboard macro for gaming usage. On the flip side of the mouse, you’ve got a switch on the right hand side and a latch control on the left hand side. The switch controls what sensor is to be used, and also allows you the option to switch off the mouse completely. 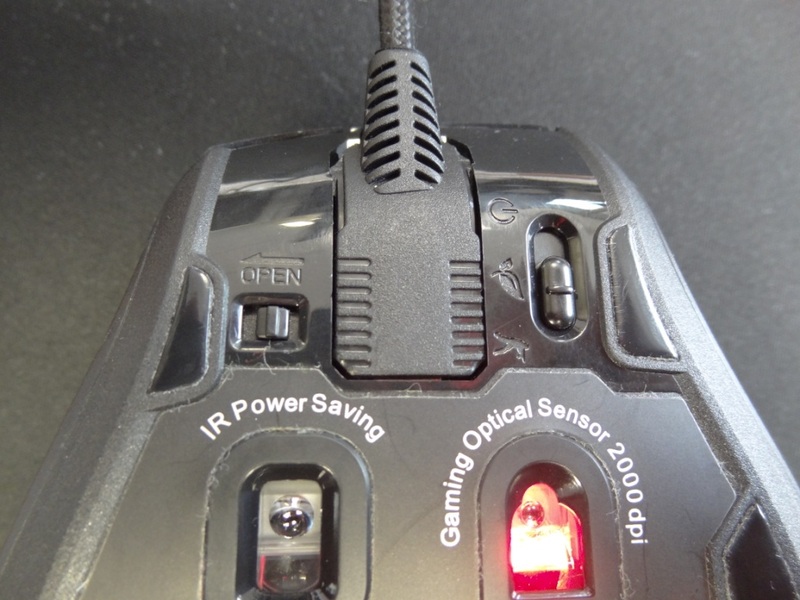 There is an option of an IR Power Saving Sensor or the 2000DPI Gaming Sensor. This switch however is NOT a profile switching button. Personally I would have liked to see a profile switch button, being assigned with the sensor switch – as it’s only natural to not need the speed and precision whilst surfing the net versus when you’re gaming. 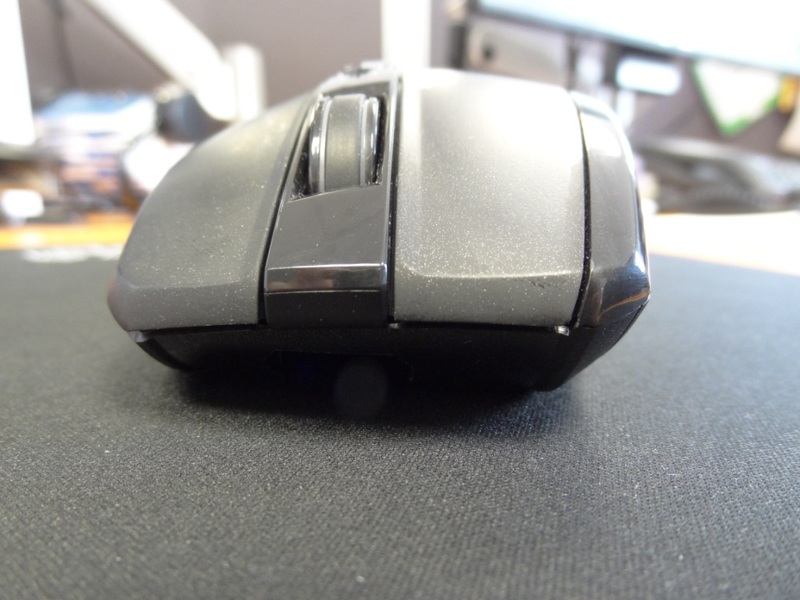 This did leave me a little disappointed, as it meant I had to go via the software each time and apply changes to switch profile, instead of physically changing the profile from this switch located at the underneath of the mouse. 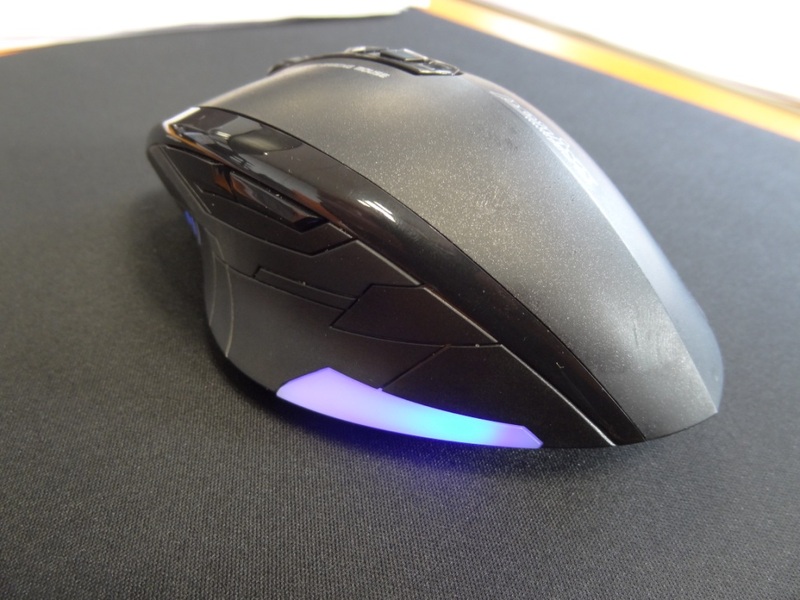 Finally, in terms of design, the mouse also has blue glowing lights at the bottom of the mouse, alongside a red glowing light located within the scroll wheel. The lights cannot be turned off, or customised in any way, but they aren’t intrusive at all – I really felt the lights added some character to the mouse. I should also note that the dock also has a blue glowing light – but that can be switched off via the software. Overall, the design is excellent, but not quite perfect. I would have liked to see a dedicated profile switching button. I was very much impressed with the build quality. First of all, the mouse itself is well built – it can take quite a lot of knocks. 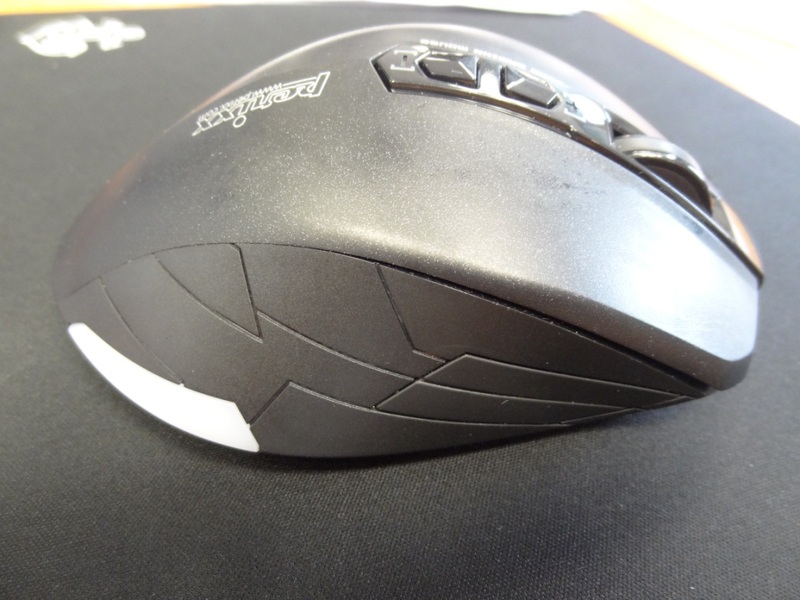 The materials used for the mouse also give a positive impression (from the scroll wheel to the grip on the sides of the mouse). 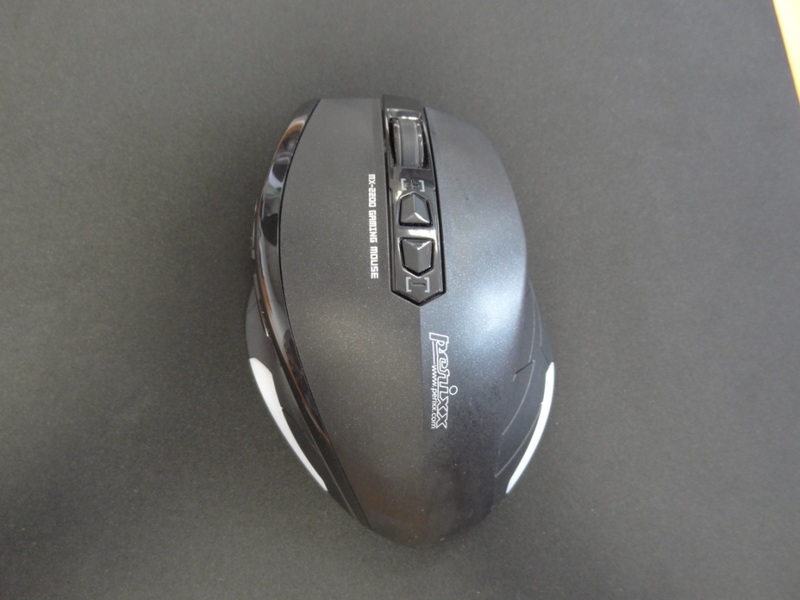 As this mouse is wireless, it also comes with a dock, in order to charge it. 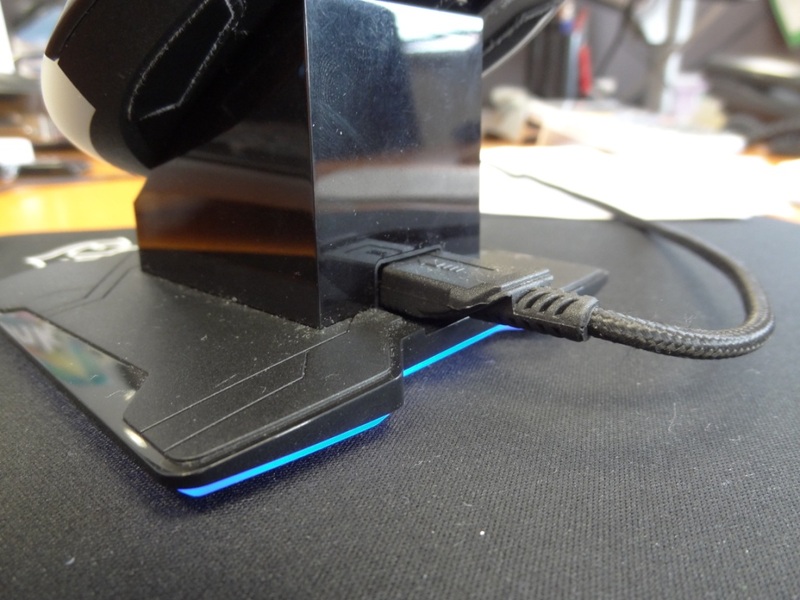 The dock is connected by a wire, that can be detached in order to use the mouse in a wired mode. 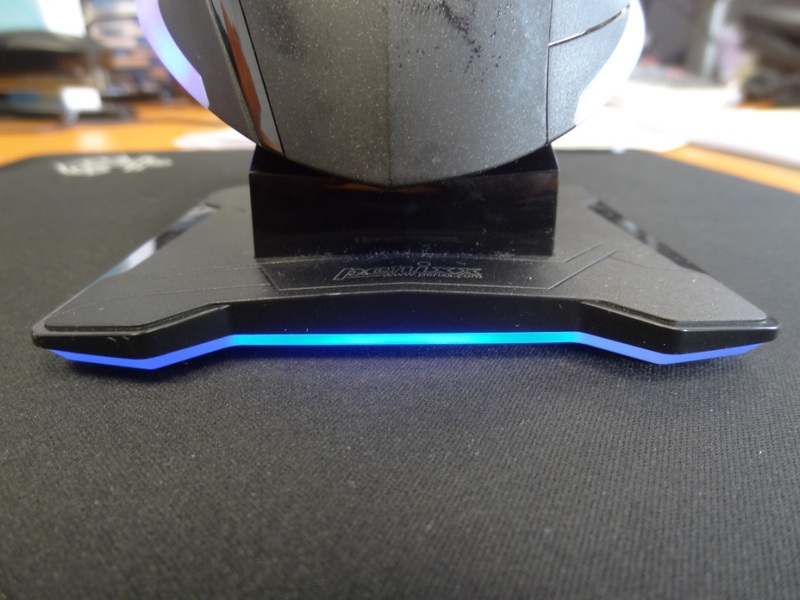 The dock, has two points of contact (that are identical to the ones on the mouse) and also has a magnetic connection – in order to keep the mouse attached to the dock, whilst charging. Whilst in wire mode, the polling rate increases from 250/500 to 1000hz. Furthermore, the latch, underneath the mouse, is used to secure this wired connection. I should also note that the dock is the wireless transmitter for the mouse. It’s very nice to have a charger and transmitter in one, however for laptop users, this might prove to be a deal breaker, as they would have to carry around the reasonably large dock with them. 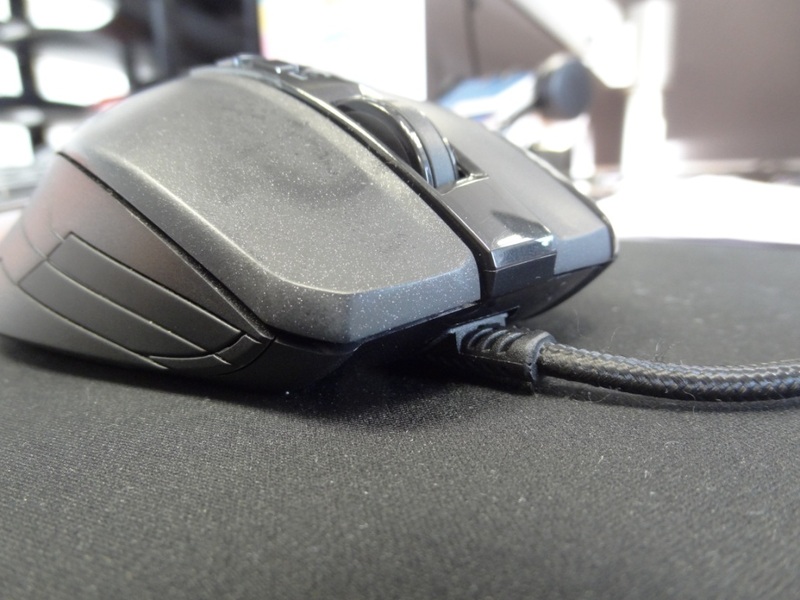 Overall, the build quality is excellent – I really love the attention to detail by Perixx and the fact that the mouse can be used in wired or wireless mode. Naturally it would be silly not to mention the battery life of a wireless mouse. I was very impressed with its battery life (despite being irregular at times). I found it to last a solid 1.5weeks of solid usage (over 10-15hrs per day), with it set to the “gaming” sensor. Thus in “office” or “power saving” mode, it would last much longer. Charging wise – it takes around 1-2hrs from 0-100% – this was with the dock and the mouse turned off. Furthermore, the dock also has a dual USB connection – which is extremely useful in order to get a faster charge. 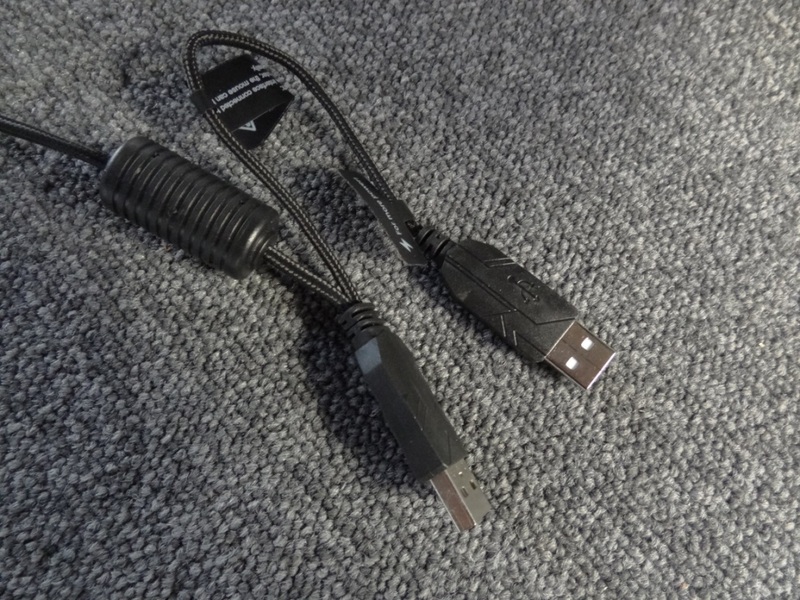 The primary USB is needed for any type of operation (wired or wireless), but the second USB is used for “fast charge”, whilst the mouse is “docked”. I should also mention that the mouse switches itself off, very cleverly if not in use. Although this might seem like a bad thing for some users (due to past experience) – the Perixx is super responsive – there’s no “down-time” from going into and out of power saving mode. Overall, I found the battery life to be very good – although not as much as I had initially hoped for, from a wireless mouse – it is still excellent. I found the software to be very easy to use. It works as intended, it has the options to change the 3 keys mentioned previously and also has the option to change things like the “indicator light”, which switches off the blue glow on the dock. You can also change the polling rate (whilst in wired mode), scroll speed, pointer speed and things like DPI levels (which are done in 250DPI increments from 250-2000). When you do hit apply and OK – it does take around 5-10 seconds for it to send it to the mouse and the mouse to become responsive to your changes. This is normal in all mice software/hardware. 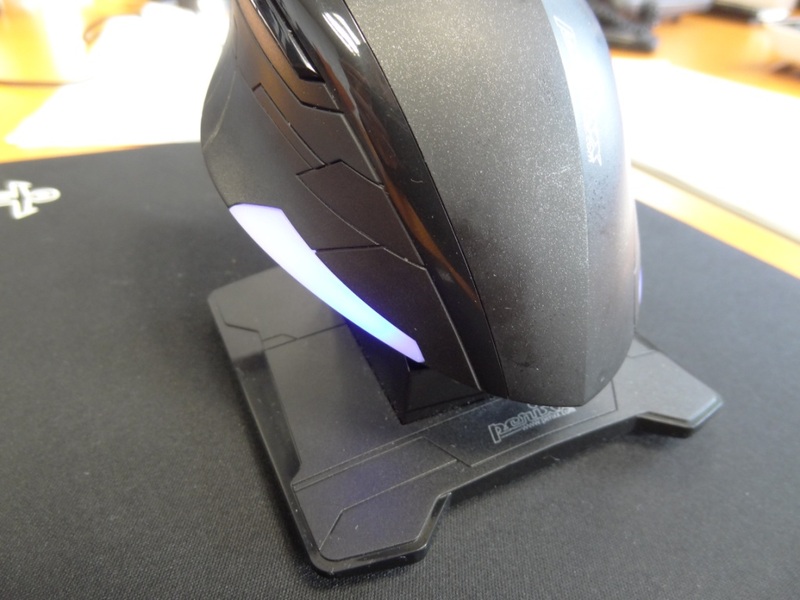 I took the mouse on the Battlefield (pun intended) and played some BF4. I felt very versatile with the mouse and really enjoyed gaming with it. Although I was more accustom to using a mouse with 7 buttons on it, I didn’t feel too uncomfortable playing with only 3. The gaming performance was slightly better when in wired mode, as due tot he polling rate – it allows you to be a little more precise with movements. This was minimal though – and thus the difference between wired and wireless mode would take a keen mouse connoisseur to notice the differences. I should note that when this mouse ran low on the battery, it started stuttering. 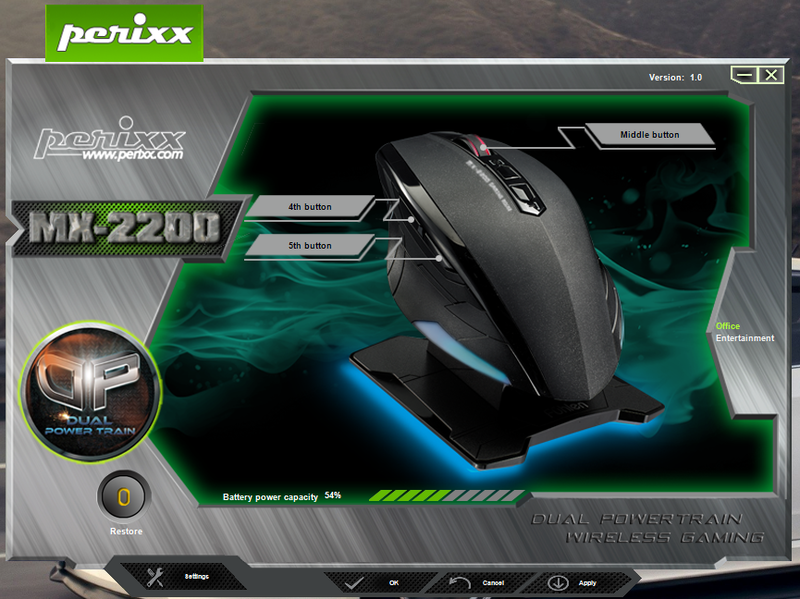 This is to be expected from a wireless mouse – but I thought I should mention it, in case people were curious about it. Finally, I should mention that I did have some problems with the scroll wheel, whilst playing BF4 – but that was quickly fixed after contacting Perixx, and them letting me know I should change the “scrolling mode” to “focus”. I would definitely suggest this mouse for any type of user, mainly for the users that want a wireless mouse, that is also a good gaming mouse too. The mouse really reminded me of the Logitech MX performance, and I think that’s an excellent thing to go by. At the going price of £40 – I find it in a good price category to recommend, especially for all its features it boasts. If however, it was a little cheaper, it would have been more attractive for users on a budget. This entry was posted in Technology & Gadgets and tagged Gaming, Mouse, MX-2200, Perixx, Perixx MX-2200, Review, Wired, Wireless on April 30, 2014 by TotallydubbedHD.